Come one, come all! Everyone is welcome – players, spectators, children, local council representatives, MPs, members of the community; we welcome all who are interested in promoting reconciliation and togetherness through sport. 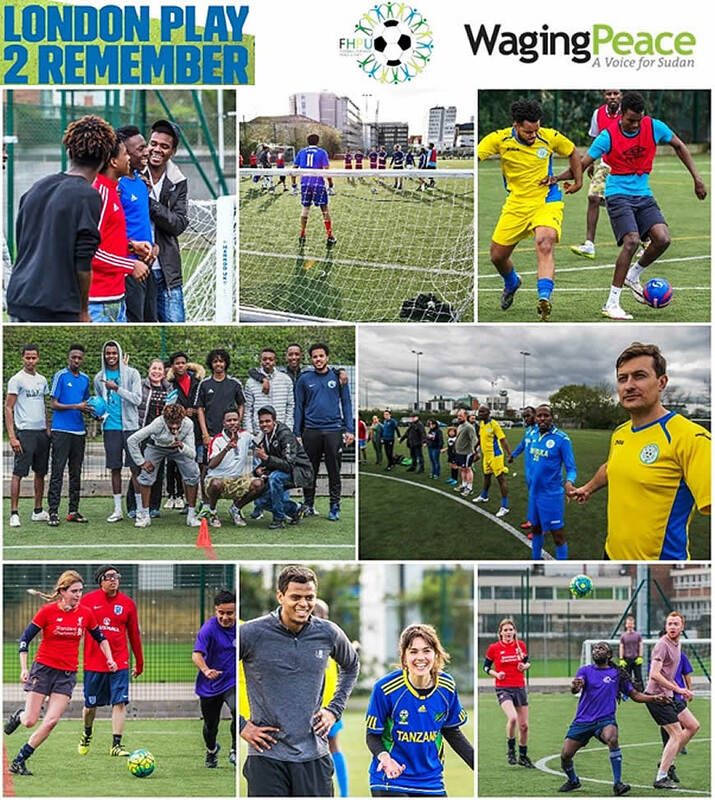 On Sunday, 15th April 2018 from 12-5pm at White City Tiger Turf in London, Waging Peace is co-sponsoring this event with Football for Hope, Peace and Unity (FHPU) for the 3rd year in a row. FHPU is the founder of ‘Play2Remember’ a football tournament and social event that provides a chance for survivors of genocide and mass atrocities, as well as their supporters, to get together in a spirit of commemoration and hope. Come and cheer on Team Sudan or sign up to represent Team Sudan (up to 10 players)! The format for LP2R 2018 will include a group warm-up ahead of kick off with a special ‘football for social impact’ demonstration. Whether you intend to spectate on the sidelines, play in the tournament, share a new experience with your children, or pop along to honour and support the survivors you’ll meet, our warm-up exercise will be sure to leave you inspired.